Us too! My wife and I have been considering a TT to replace our spacious tent for convenience (and to get up off the ground finally). 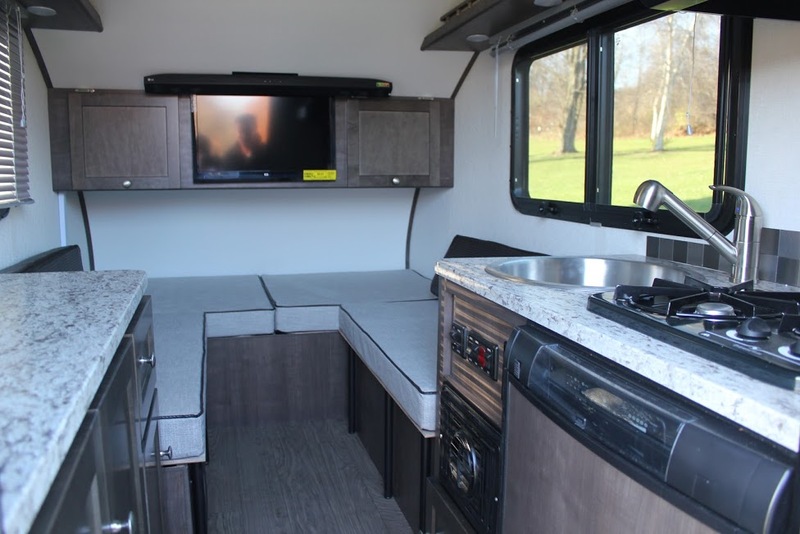 This Aliner looks like just what we were considering which is, basically, just a bed-on-wheels with some kitchen accessories. Please let us know what you think about its construction and future availability. I never saw a return review so not sure why not but didn’t happen as in no carry through. I saw an Ascape going down the road for the first time in Kalispell MT yesterday so searched fot it as soon as I got home. The ST version is the one I’d be interested in because it does have a full wet bath. I prefer dry baths but beggers can’t be choosers and I do like the lay out. Being short I could make do as a bed on the back end just fine for me alone. I’ve always prided myself on being able to sleep just about anywhere. I think I’ve slipped a bit over the past 8 years. But I am still tent camping and maybe for my 70’th year I’ll treat myself to a small camper. I’m torn between finding an older vintage that hasn’t been ruined with horrid paint jobs and junk attached inside and out like flower boxes or hot dog stand color combos or these newer small campers. My husband who doesn’t camp unless it’s a means to an end like off to a park to reunite with family or friends. I’m on my own so what I like is what will be what we eventually own and now and again share. This has some great qualities and a few questionable ones. Weight is good as is a wet bath..some storage or a hitch on the back for adding a swing away cargo carrier for bikes and other luggage would go a long ways in helping one decide too. None of them mentioned installing a hitch. Holy Cow! based on the pictures you sent with your announcement, this looks like the perfect sized trailer to tow with my 4 cyl Mazda 5. Finally somebody made a trailer for our class of tow vehicles and I don’t need a pickup to get the job done! Holding my breath until your next update reporting in after the show. 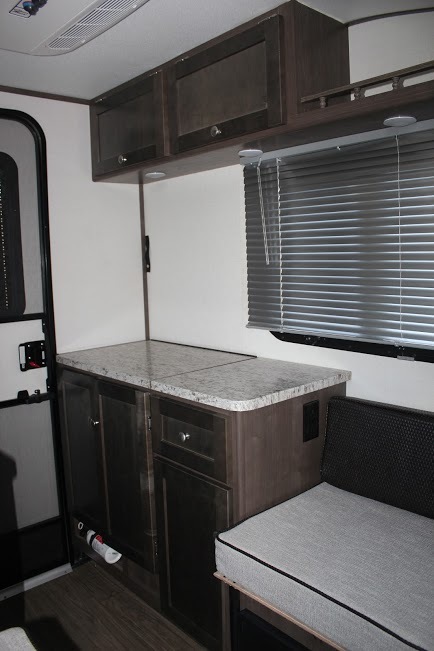 Great to see new offerings in this small of a travel trailer. Problem with this is: It’s a royal PAIN to change the bed into a table and back every night. A full time bed and a small table somewhere would be much better. I have the idea to do the 1/2 bed and leave the rest as bench and table, too, with curtain to keep the bed part private. Have you seen the new Tab 400? I saw that at Louisville last week. Nice looking, but that fridge was waaay too puny. Looked like one they put in a T@B Basic. I think once the sticker price is revealed, that will tell if it’s success, which I suspect it’ll be in the $30k ballpark. It’s also quite heavy compared to the T@B 320’s…about 1,000 lbs more! At almost 2,700 lbs, the 400 really should be towed by a 6 cylinder vehicle. Check out the Aliner MT. I doesn’t have all the “stuff”. It is basic with a bed in the front and a table in the back. Ive been an Aliner owner for the past few years. Definite pluses and minuses to the Aliner. The biggest issue that I have is interior sweating on the aluminum surfaces when camping in cool/cold temperatures. I have been in the Pacific Northwest for the past 10 weeks. All the sweat has ran down in , especially in the corners, causing mold and mildew to grow on the plywood under the cushions. If they had sprayed all exposed aluminum (before assembly) with spray-on truck bed liner, this would solve the problem. 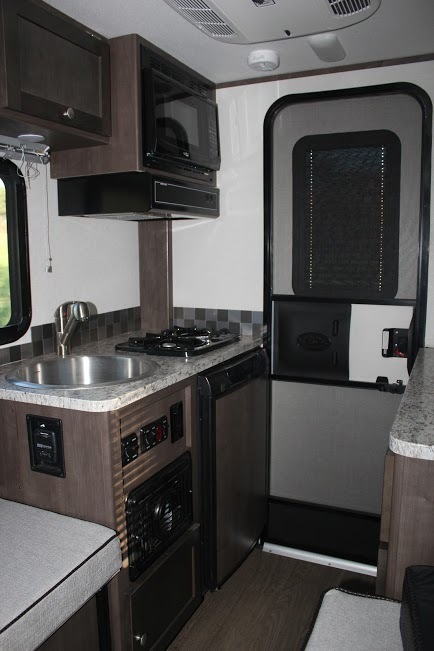 The other issue I have with a lender and most of all American-made RVs, is that they need to hire an interior designer. I don’t know why they think that everyone likes fake wood grain. And the curtains are hideous. 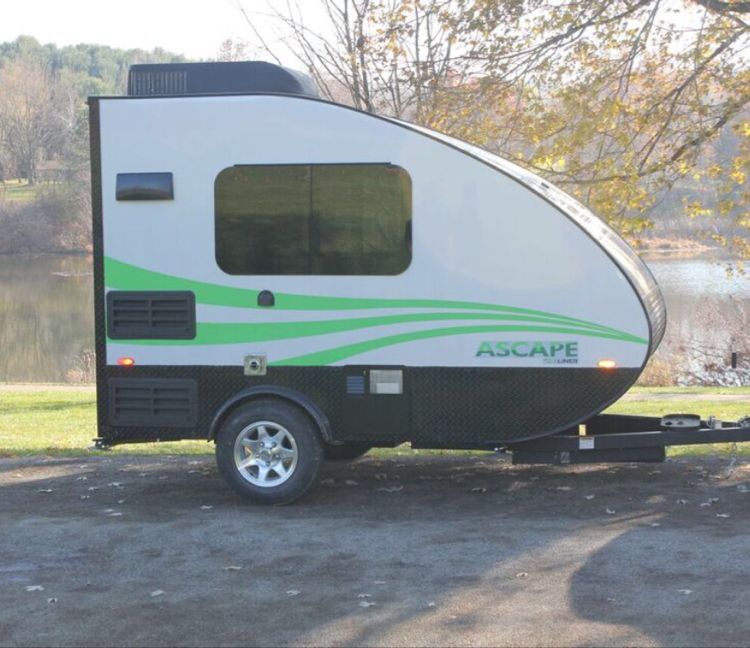 I notice that this Ascape it’s looking more and more like all other American RVs on the interior. Whatever happened to actual “camping?” Having an exhaust fan over the stove goes just a little too far in my opinion. Hopefully the flatscreen TV is an option, because I don’t want to be near a television when I’m camping!! Welcome to the New Reality for a vast developing market of small light weight TT,s. I can’t wait til after T’day to post am few considerations. Love the look of this little camper. We have a ’69 Shasta Compact, 10 linear feet inside, that looks amazingly similar to the photo above (it’s been completely redone). 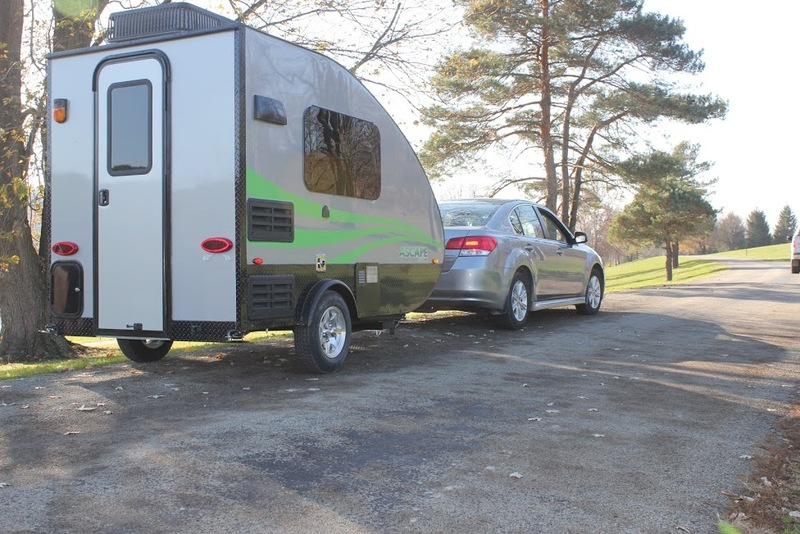 It’s about time the manufacturers are returning to small travel trailers for several reasons…easy to pull, great gas mileage, only the bare necessities which translates to eco friendly traveling fun. I’m curious about the price and look forward to more photos after the show. Love this blog! This trailer fills a real gap in the market — and don’t let anyone tell you that it looks funny! Someone mentioned making and unmaking the bed every day — I have been doing it for years in my little Fun Finder (a model no longer made). It is no big deal to remake the bed, and it is a small price to pay for the nimbleness of a tiny but comfortable trailer. Plus, the Ascape will fit on most driveways — no monthly storage fee. Good luck with this new product, Aliner!! I’m loving the looks of this new camper, and I wouldn’t mind the bed/table situation. My only problem is I don’t think it will fit through my garage door, still too tall. I live in a townhome, so it has to go into my garage, I don’t want to pay for storage fees. But I will keep watching this camper, my home situation could change! According to the spec sheet provided by Aliner, an Ascape without AC is 7’5″ and with AC it’s 8’4″. should work. I need something w/ A/C, not everybody does. They do make window AC’s for campers. Perhaps that would work instead of the roof models. Another thought are the tiny swamp coolers but they have a lot of limits including produce too much moisture insde a small space like this. Even the tiny versions might cause condensation problems. Some owners of Aliners complain about condensation and mold development so not clear if this model would come with that problem but I suspect it could. This is a great little trailer! I wish the interior wasn’t fake wood. Would be nice to have more choices with color combinations. Tab 400 is a different trailer all together but the interior cushion covers and lighter wood would make this my first choice. Yes….I’m one of those solo woman campers that like nice interiors! Me too! Just bought one! I agree about interior. Happy to hear there is yet another solo female camper out there. I still haven’t given up the tent but I notice I am looking more seriously at the small campers these days than I used to turn my nose up at. After 50 years with tents all through college till now…hubby never has enjoyed it and I do love it. So picking up items that are expensive but adaptable to small or vintage small campers to remake myself. I hate the ones others often do with the over the top fake flowers and do dads. I’m a practical person and esthetics that are uncluttered far out rank posies and knick knacks. (I once allowed someone to move their camper onto my campsite who I understood was going to just wait a few more days until I left instead got their camper set up and unloaded every kind of yard ornament mostly ugly and cheap they must have hit every free give away yard sale in the state. And to top if off these strangers TOLD ME TO MAKE SURE I MOVE THE SOLAR POWERED DO DADS ABOUT THE SUN so they would glow at night as they took off for two days leaving me with this invasion of jumk. I won’t be so generous in sharing my campsite in the future or so gullible either way. Meantime this camper has the right weight but so needs some help in design. And light interior no fake wood goes a long ways to making it comfortable to breath in a small enclosed space. WINDOWS with good night shades or tinted windows helps. I can tint thewindows myself. Go girls… I’m not interested but for solo females that don’t value their independence quite as much…..sistersonthefly.com might be something you’d like. is $18589. and they have a preorder price of $15,500. When compared to a T@B, it seems to be a good alternative. Lighter, shorter, and more headroom. And a bit cheaper. Love it ! We are interested in modern more European style RV’s. I have had Aliner products in the past and they are a well built quality product. Could you ad a small wet bath (shower/ toilet combo), if so let’s make a deal ! Thanks for being creative and thinking outside the RV box ! They did add the wet bath in the ST model of this trailer the weight went up a tad is all. I think dry weight was around 1550. Check out the floor plans and hung specifically for the Ascape ST. Also the plus has the toilet in a cabinet style but I would prefer to go with the wet bath myself. They’re not quite yet on dealer lots, but one dealer I found on rvtrader.com had a pre-sale on one with AC for $15,400. Without the AC, depending on region, I would suspect maybe just under $14k? Frankly, for such a small trailer the galley is a little too complete ! In a unit that smal the assumption is that you would be ” camping ” , i. e. Cooking outdoors !…I think the space could be better utilized with a small 2 person dinette. You would still have space for a portable butane burner and microwave, sink, etc. I like what I see in the pictures, but would like more information. How is the bed made? What is holding it up? Where is the fresh water tank, inside the cabin or outside? Do you need stabilizer bars to tow? I would like to see more video’s demonstrating the camper in more detail. How tall is the exterior with the AC ?? Was wondering if it would fit in the garage ? On Saturday, I pick up my Ascape in Phoenix. 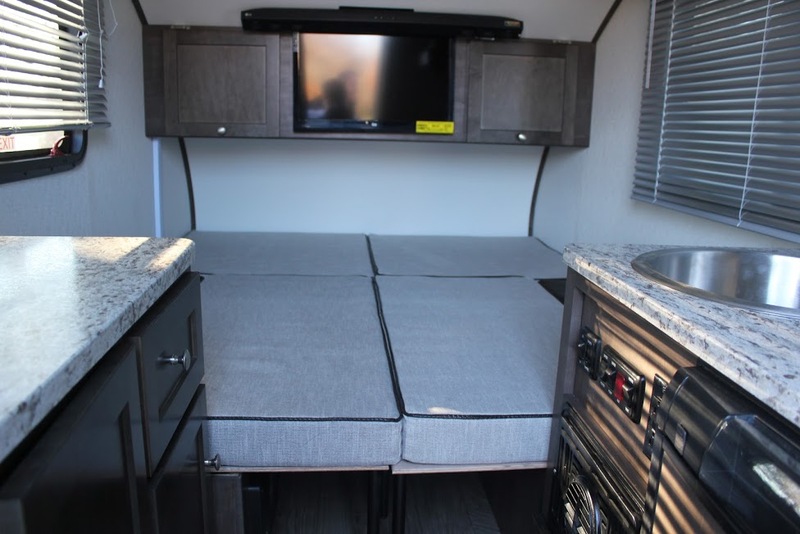 I’ve been looking for something like this for a couple of years and am excited to finally have a small RV with lots of creature comforts (maybe more than necessary, really). The dealership had many high-quality trailers from teardrops to T@B’s on the lot. All are nice, but this one seems to have it all. It’s about 700 pounds lighter than the fiberglass trailer I have towed for 12 years, so should handle much better behind my 4-cylinder Tacoma. Would be interested in following up on owners’ experiences as time goes on. Loren – Congrats! Keep us posted on how you like it! loren cant wait to hear how you like it. I love the size. I have used this only one night so far, but it is a great little machine. Very comfortable for sleeping and has all the conveniences one needs. The A/C works well, as does the furnace (I used both because of the desert extremes). I enjoyed the BlueTooth-connected sound bar. It’s not audiophile quality, but classical guitar music sounded great – certainly much better than what is typical from small, portable BT speakers. The Ascape seems well built and it’s obvious a great deal of thought and engineering went into this unit. It pulled well behind the 4-cylinder Tacoma and I’m now planning a road trip up the PCH. Would love to hear of others’ experiences with the Ascape. What is your 4cyl Tacoma max towing rate? I have 6 cup tab 4 and it’s only 2000. Would like to know if 2 bicycles will fit inside during transit, as this unit cannot have a hitch. I’m very interested but we need to take our bikes. This could be a deal breaker. Been looking for something this size and weight for a long time. Hi, Ann. The aisle inside the trailer is certainly long enough and wide enough to fit two bikes. They would have to be carefully stowed, so they wouldn’t damage the seating area and the lower cupboards and other installed items (maybe by just covering them with some canvas or other heavy-duty material). The main challenge might be the small step up to the seating and table area, but that might be easy to overcome, too. The table and pedestal would have to be removed during travel, but that’s easy to do. My first trailer was a Cabin A, the difference was we had a great little shower with head. We also had gray and black holding tanks. Take out the TV and add the Cabin a inside shower and then I might be interested when I down size. 40# propane bracket was mounted with 4 aluminum 3/16 pop rivets that immediately broke first time on the road. When I went to add some 1/4 inch grade 8 bolts to refasten, I found that the gas hose was pinched between the frame and the bracket so no gas would flow. two of the gas line fittings were only hand tight and leaking. That’s why the heater didn’t work the first night of sub freezing weather. Also shows that the trailer was not tested nor safety checked before leaving the factory. Didn’t get a users manual with the trailer, called the factory to find a download site, but was told they would email me the file, never got it. Battery continually goes dead unless you unhook or charge all during parking.